It’s no secret that actors have superhero-sized egos – especially when they actually play a superhero. Case in point: Mark Ruffalo, who picked up an Academy Award nomination for his role in last year’s Oscar-bait The Kids Are All Right, and who has now thrown himself into the role of his career – The Incredible Hulk. Ruffalo will be the latest actor to portray Marvel Comics’ Jolly Green Giant in next year’s big budget spectacular, The Avengers, which will bring the cinematic versions of Marvel’s characters, including Robert Downey, Jr.’s Iron Man, together to save Earth from an intergalactic menace. 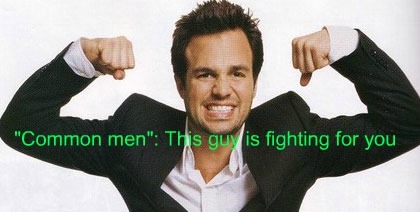 Now, Ruffalo is a fine actor, and I personally can’t wait to see his Hulk smash next summer. But this is utterly ridiculous. The “common man” he believes himself championing is being continually squeezed by high energy prices, but a wealthy man like Ruffalo is above such petty concerns. He doesn’t have to worry about being able to afford to heat and light his home, but millions of low and middle-income Americans do. Also, there are plenty of unemployed “common men” who would love to work for companies trying to bring new sources of energy to market, but again, the actor is above such concerns – unless The Avengers bombs at the box office (unlikely), sequel-crazy Hollywood will likely guarantee Ruffalo employment as The Hulk for years to come. The most pathetic aspect of Ruffalo’s self-aggrandizement, however, is his portrayal of himself as the underdog in this titanic struggle. Please. With the Environmental Protection Agency, myriad state and local agencies, the entire Democratic Party, and a worldwide coalition of anti-fossil fuel enviro groups standing in the way of any sensible energy policy (which would include, you know, actually exploiting our energy resources), the companies brave enough to actually try and find and extract natural gas are if anything the heroic underdogs. If Hulk really wants to fight for “the common man”, he should take on Greenpeace in a battle of the Emerald Behemoths. But don’t hold your breath. Another useful idiot for the left. Now that the pipeline project will not happen, 100,000 some jobs will not be created. This means that 100,000 families will not be able to put food on their tables. Therefore I propose that Marc Ruffalo, send each of these families a check for $75,000, which each job was projected to pay. Maybe he can include a letter to the children of these families, explaining why he believes their mother or father, ought not to be able to provide for them. It’s all about killing America. Green is the new Red. At one point the hard left had no real foundation or belief system. As humans we naturally look for reasons why seemingly unexplainable things happen. They saw the weather changing, it must be something evil – man did it – they’re evil. Bing, Bam, Boom a religion was born. Anything (they think) adversely affects the weather shall be eliminated. Industry first then man itself. I recommend the lefties go first and eliminate themselves and their polluting posessions in an environmentally friendly way. Are they gone yet? Good – now we don’t have to listen to them and their constant whining. Earth First – Then we take Mars! The loud or in his case nots so loud crash was his career ending. I bet he thinks Che was a warm friendly guy. He joins with Oliver Stone in believing Hugo Chavez is one of the greatest humanitarians of our day. Previous post: EPA Wastewater Regulation—What a Waste!